Crop to just the part in question. Now there is no doubt what buttons you’re talking about. And, to the practiced eye, the screenshot also provides other information. The different buttons available can indicate what version of Picasa you’re using, the Blue icon indicates that you’re working with an album, etc. 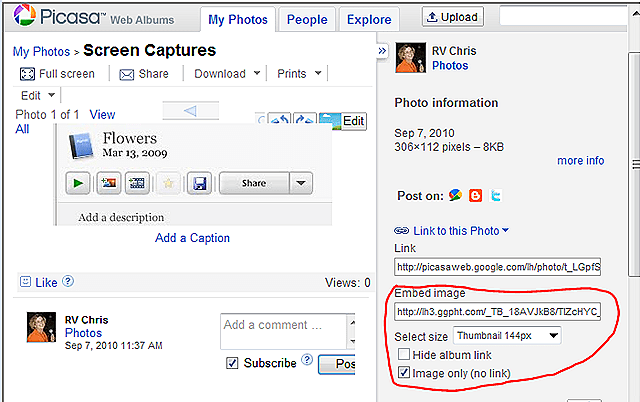 Upload to your Web Album: Upload this image to an album called Screenshots (or Screen Captures) and make it public. This makes the image available to link into the forum, or maybe an email. However you are communicating. Grab the URL for the image by opening the image on your Web Album and clicking on ‘Link to this Photo’. Make sure to check the box for ‘Image only’ – and probably change the size from 144 to something larger also – then copy the code that appears in ‘Embed image.’ That is the URL or web address for that one image. Paste the URL code: Back in your forum, choose whatever tool is provided for inserting an image. Most of them will accept the URL (http://lh3.ggp……jpg) that you copied in the previous step. My bet is that you’ll receive better answers to your questions when you include a screen capture image. Published by MrsGeek, in Blog. 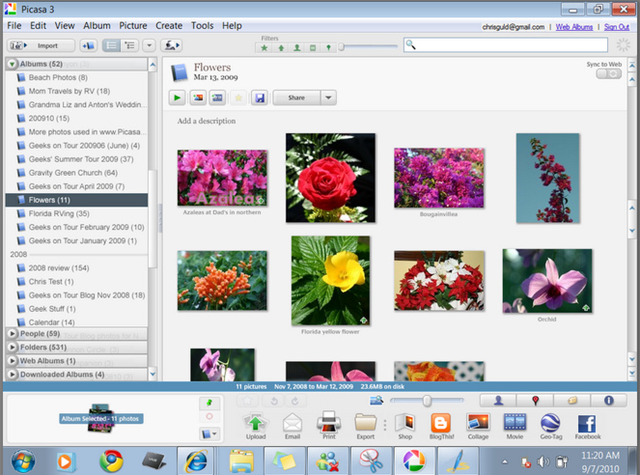 Tagged with picasa forums, screenshot.